And then comes this: Turner Classic Movies (TCM) will launch an online course next month (in conjunction with Ball State University, IN) called Into Darkness: Investigating Film Noir. The nine-week course, taught by Richard L. Edwards, PhD., and Shannon Clute, is absolutely free. You can read more about the course here. I knew it would be impossible to top last month’s explosion of films (including the Annapolis Film Festival), so it’s no real surprise that April was a bit light. But hopefully you’ll find something here to strike your interest. Other than a couple of reissues, May looks to be a pretty light month for film noir Blu-ray releases, but there are a few interesting neo-noir/noir-related films. If you know of any noir releases I’ve missed, please let me know! 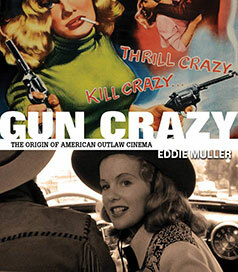 The Saturday Evening Post may just possibly be the unlikeliest place to give birth to one of the all-time classics of film noir, but that’s where Eddie Muller’s Gun Crazy: The Origin of American Outlaw Cinema begins. Things are going absolutely crazy around here, and I know I haven’t posted much from the movie world lately, but there’s much on the way. First, many thanks to Now Voyaging: Journeys Through Life and Classic Film for nominating me for a Liebster Award! I look forward to participating in that process soon. Just say the name Eddie Muller and you’ve got my undivided attention. I think my first contact with Muller’s name was from listening to one of his DVD commentaries (which you can find here). 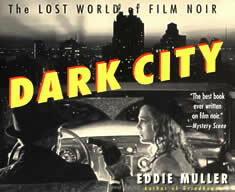 Later I learned that he has written several books (fiction and non-fiction) on noir, so I sought out Dark City: The Lost World of Film Noir and was not disappointed in the least. Dark City stands both as a great introduction to film noir and an excellent resource for those who are already noir fans. Muller’s writing style recalls the hard-boiled prose style of Cain, Hammett, Chandler and many others, which makes the book all the more enjoyable, but the main selling points are Muller’s knowledge of noir and how he conveys it. Novelist James Ellroy didn’t call Muller “The Czar of Noir” for nothing. Muller knows this stuff inside and out, backwards, sideways, through a strainer, meat grinder, you name it. Rather than presenting us with a long, boring history of noir, Muller jumps right in, giving readers the essential aspects of noir in chapters such as “The Precinct,” “Shamus Flats,” “Vixenville,” “Blind Alley,” “The Psych Ward,” and more. Each chapter includes what makes each theme important to noir and discusses films which represent those themes. Yet knowing about the films means little without an examination of the times and conditions under which they were made and this is where Muller outdoes himself. Dark City is a study of American culture and life in the 1940s and 50s as well as a look at it’s noir offerings. Frequent excursions about the stars, directors, writers, and cinematographers aren’t really excursions at all, but rather essential information in helping us understand what makes film noir. And the photos? Stunning. Very highly recommended. I’m following this book with another from Muller, which I hope to start today, the recently released Gun Crazy: The Origin of American Outlaw Cinema. This book is not available on Amazon, but you can order it exclusively from Black Pool Productions.